Ra God was a version of the sun god , and Egyptian art often represented him with the solar disk - a circle drawn over the head if deities associated with the sun . Frequently Ra was depicted with the body of a man and head of falcon . Ra's human body and falcon head were often similar to depictions of the god Horus , the difference being that Horus wore a crown on his head while Ra God were the disk of the sun encircled by a cobra . (The association with the cobra suggested his fierce and destructive nature , witch will become apparent in the story of the destruction of humankind to be told in the next chapter ) . Ra was usually shown holding a scepter in one hand and a ankh in the other . The ankh is one of the most popular Egyptians symbols , both in ancient art and is modern reproductions . A symbol of life , it is shown in many drawings held by a god in front of the kings nostrils , so that the breath of eternal life would enter his body . On some temple walls i Upper Egypt the ankh was used as a sign for water in rituals of purification . Here the king would stand between two gods ( one of whom was usually Thoth ) as they poured over him a stream of libations represented by ankhs . The ankh was also used decoratively on thrones and platforms for kings and gods . Its origins are obscure some believe it was a rendition of sandal strap , or a knot . Guides in Egypt today like to tell tourists that the circle at the top represents the female sexual organ , the stump at the bottom the male organ ,and the crossed line , the children of the union . This interpretation may have long tradition , but scholarly research has so far field to verify it . You rise m You rise , You shine , you shine , you who are crowned king of the gods . You are the creator of those who swell in the heights and of those who dwell in the depths. You are the One God who came into being in the beginning of time . And you do give life to all therein that is . You have made the heavens and the earth. Worshiped be you whom Mat ( The goddess f truth and Justice ) embraces at morn and at eve . Ra God appeared in other forms , depending on the role was playing at the moment i am Khepri in the morning , and Ra at noonday and Atum the evening . Khepri (variant spelling , Khepera) was the god of the scarab beetle , and in Egypt the worship of the scarab was much older than the worship of Ra . That Ra became associated with Khepri ad the scarab is further evidence that the priests of Ra were able to assimilate their more recent god with thew established ones . This particular association , however , had a fascination biological origin . Ancient Egyptian had observed that the scarab beetle laid its egg in dung and then pushed it around on the ground until it became a ball . The Egyptian imagined that the call symbolized the sun because it was round . gave off t heat , and was the source of life , and because it seemed to represent the self - creative powers of the sun god . They then pictured the sun being pushed across the sky by a giant beetle . Eventually this imagery became associated with death and rebirth too , since it appeared that beetle had died and was born again when the larva emerged from the ball . When the sun god assumed the character of Khepri , he was usually depicted in human from with a scarab either on top of or in place of his head . Like Ra , was most often carrying an ankh and scepter , and he was considered a god of creation . since since the beetle was most often observed in the act of creating itself anew . Khepri was also associated with the resurrection of the body . since that was what seemed to be happening when the scarab was born . This fact explains why Egyptians placed the scarab in tombs and on bodies of the dead . this , then , was the form of Ra in the morning. ... Atum is one of the oldest forms of the sun god to to have been revered by ancient Egyptians , and it was this form that Ra was supposed to have created the universe out of chaos . In in temple drawing he was always represented as fully human , without an animal head . He was especially revered because of his association with souls of the dead . He rode in the solar boat during the final hours of daylight preparing to fight his opponents in the night . It was believed that souls receive recently released from their bodies waited at the beginning of the valley of the That (the underworld ) for the solar boat , which meat that they came aboard just as sun went down into he underworld the time when the pilot of solar boat was Atum , the form of Ra in the evening. I addition to Ra's manifestations as khepri and Atum , he was linked with numerous other gods throughout his long reign . very early he was linked with Horus to form the assimilated god Herakhty . or Horus as the morning sun ; it was this relationship that led Egyptians to depict Ra with falcon's head . During the middle kingdom . when Amun and his Theban priests dominated Egyptian religion , Ra was assimilated with this god from the south to form Amun -Ra whose , worship in Thebes (now called Luxor) led to building of the temple of karnak , one of the most imposing religious structures mad by human beings .The curious student of 5ra today will find scant remains of the once considerable worship of this god . His character was so much assimilated with those of other gods , or other gods so often acquired his attributes , that only rarely now do we find relics that depict him singly . Of the mighty ,temple at Heliopolis , little remains now but the single obelisk. The exact date of the destruction of this temple in unknown , but some time the Christian era little remained except stones that used for building else where in egypt . South of Cairo the worship of the sun god almost always involved another god , usually Amun , Walls of the tomb of Seti I , one of the most impressively craved tombs in the Vally of the Kings , depict the myth of the destruction of human king under Ra's order ( see Chapter three) , the adventure of Ra ) . other royal tombs there contain a list if seventy - five praises of Ra that reveal his character . as in this example ; Praise be unto yo u , 0Ra , you exalted power , who enter enter into the hidden place of Anubis ( god of death ) ; behold ; ( your ) body is Khepri .Even further south at Abu Simble , Ra was again worshiped in combination with other gods ; the Great Temple of Ramesses II was dedicated to Ra-Herakhty . Ra was also depicted in the papyrus scrolls that male up what we call the book of Dead . They contain hymns and prayers to Ra in his various forms , as well as numerous beautiful drawings of him . The papyri are in libraries in Europe now , Bur they can be consulted in published works , some of witch are listed in the Further Resources of this blog. Drawn vignettes in the Papyrus of Ani show Ra as a falcon -headed man wearing the solar disk while while riding in his boat . Other drawings s show khepri and Atum in the solar boat . 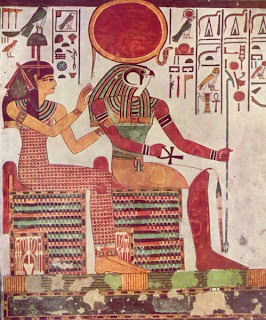 In the papyrus of Hunefer , Ra us shown with a full falcon body , wearing the solar disk encircled by a cobra . The God is honored by Hunefer and his wife and adored by seven baboons ( presumably on for each day of the week ) . Baboons chatter so much at the rising of the sun that the ancient Egyptian began to associate them with the sun god m an association that can clearly be seen on the face if the Great Temple at Abu Simble . The same papyrus also contains an important tatterdemalion of Ra as the cat with a Knife attacking Apophis , whose story its told in the following article . Hunefer identified himself with those who , like the cat , protect Ra from his enemies . The Papyrus of Anhai contains a beautiful drawing of Nun holding the solar boat . Inside at the center of the boat is not Ra , but as scarab pushing the solar disk skyward , where it is received by Osiris and Nut . Watching the rising rising sun from advantageous positions inside the boat are seven deities , one of whom has a falcon head and may well be Ra. I studied him for three months then wrote and published a book on him. Well done, most of your information is correct. I am Making a Site on this person and we needed info. This helped alot. Interesting...you're aware he is actually Rama? Son of Ptah (Buddha)? Ptah, the Creator god of the gods, the potter? That Amen Ra, or Amun Ra, was called Khepru, not Khepri? Silent K? Heperu? Amen Ra priests were called HaCohen HaGadol? Cohen priests of Heperu...can you see? Do you have "ears to hear"? satan is not a creator of anything. satan mock the Holy Father in everything. The word of God says lift up wings of eagles. They that wait upon the Lord shall renew their strength they shall mount up with wings as eagles, they shall run and not be weary; they shall walk and not give up. Isaiah 40:31. This owl is satan way of mocking the Holy Father.